DUNEDIN, New Zealand (AP) — Center Malakai Fekitoa scored two tries as the Dunedin-based Highlanders beat the Melbourne Rebels 51-12 Friday to open the sixth round of Super Rugby. 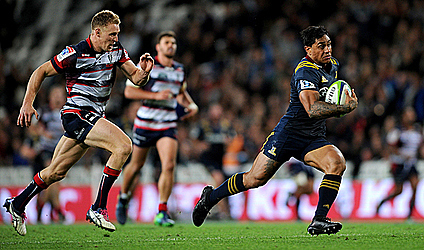 Fekitoa scored the first of the Highlanders' six tries in the 12th minute, then added the fifth in the 71st minute to ensure the Highlanders grabbed a bonus point. The Highlanders had overwhelming shares of possession in both halves and used them to fashion a 20-0 lead by halftime. Stand-in flyhalf Marty Banks kicked five conversions and three penalties from as many attempts to tally 19 points. Fekitoa scored the opening try in the 12th minute when inside center Richard Buckman was able to run without attention from the defense and to turn the ball infield to Fekitoa who scored. Buckman also featured in the Highlanders' second try four minutes late, carrying the ball upfield and passing to Tom Franklin who drew the defense before captain Luke Whitelock scored. The Rebels replied with a try to winger Tom English before the Highlanders reasserted their control with a try to Buckman, who took a quick tap and attacked the goal line from a penalty. Flanker Gareth Evans increased the lead with a try in the 61st minute and Fekitoa had his second 10 minutes later. The Rebels showed their competitive spirit with a try to Reece Hodge in the 77th minute, but the Highlanders broke the 50-point barrier when prop Greg Pleasants-Tate scored in stoppage time. "I think it was an awesome occasion tonight, a good way to celebrate (scrumhalf) Aaron Smith's 100th Super Rugby match and just put a good performance up," Whitelock said. The Rebels remain winless after five games this season.